I can't remember if I've already told you about this, but I can't find a post so probably not! It's one of our newest fast-food finds, and it's tons better than the usual suspect, both in terms of flavor and healthiness. Unfortunately in price, as well, but once in a while, it's definitely worth it. So - what is it? It's a shrimp sandwich. 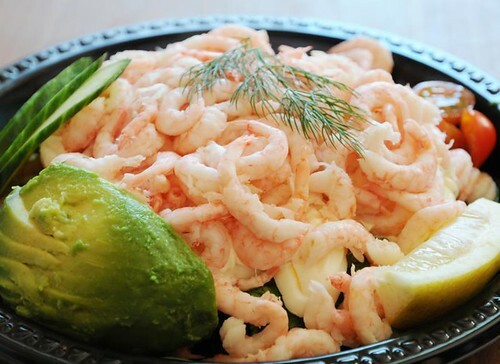 It's quite traditional in Sweden - usually a mound of fresh shrimp on a soft and slightly sweet bread, with sliced boiled eggs and mayonnaise. This one also has avocado and tomato, and a little bit of lettuce. What you can't really tell from the photo is the size - this thing was huge! It's the size of a dinner plate, and was plenty of food for two meals. We had mistakenly bought one each, but there was no way we could finish them. Next time, we'll share! Where to get this deliciousness then? Melander's Fisk in Nacka Forum, and possibly in their other locations as well, but I can't say for sure. It costs 175 SEK, but I assure you that it's well worth it. Oh, my memory is really bad!! I keep a notebook with topics to blog about, but when I blog away from home, it's hard to keep track. Still, I dont know why it didn't come up in the archive search. Oh well :) glad you like the photo! I'm allergic to shellfish to well I shouldn't say anything but the price of shrimp sandwiches always seems steep to me. But then I don't eat them, I can't say which are better than the other. yummy! i love shrimp sandwich..
jus curious.. those frozen shrimps fr ikea... do i need to cook them again? or just thaw them out of freezer n eat them straight?